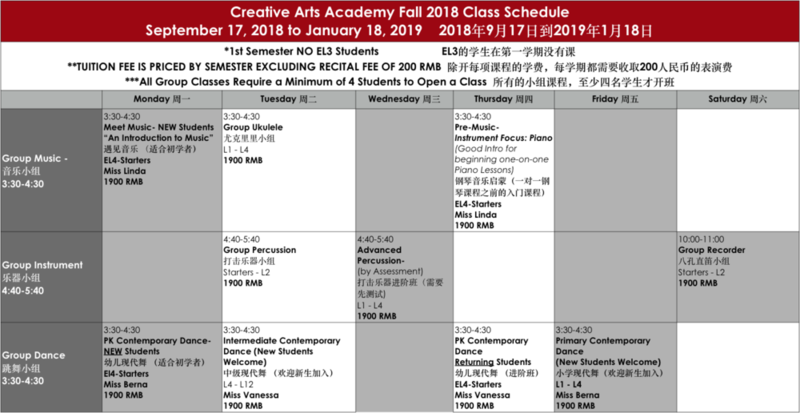 The Fall Semester runs from September 17 to January 18, 2019. These classes are open to registration for anyone! Fall is a great time to join one of our new and exciting group classes, or pick up a new instrument that you might be interested in. One-on-one classes are available on both day-time and after-school hours, so take a look at the schedule and class descriptions below and register today! This is a new class that is going to be super fun and exciting! If your child has already taken a pre-music class, or if this is their first time, they are going to deepen their general music foundation AND start applying this knowledge to practical playing on the Piano. It is no wonder that the Piano has been a first-instrument-of-study for many musicians, with it's simple layout and forgiving sound. This class will be a great preparation for those students interested in taking one-on-one Piano lessons. NOTE: ALL NEW STUDENTS WILL HAVE TO PAY A ONE-TIME REGISTRATION FEE OF 250 RMB. Is there a Class/Instrument that you are interested in, but don't see it on our offerings this semester (or not in your child's age group)? "To provide a platform required for performers to gain the experience needed to enrich the community through frequent performance and group collaboration." It is part of CAA's mission to grow our students' talents, and ALSO to give them the opportunity to use these talents to enrich their community. This semester, you can expect to accompany your students and their class to perform in the local community. We will be visiting the Shanghai Healing Home, nearby parks, and local Nursing Homes. Stay tuned for more details and performance schedules. We are happy to have Ms. Emma in charge of CAA Registration and Teacher Schedules this year. Please contact her with any registration/schedule questions via WeChat.